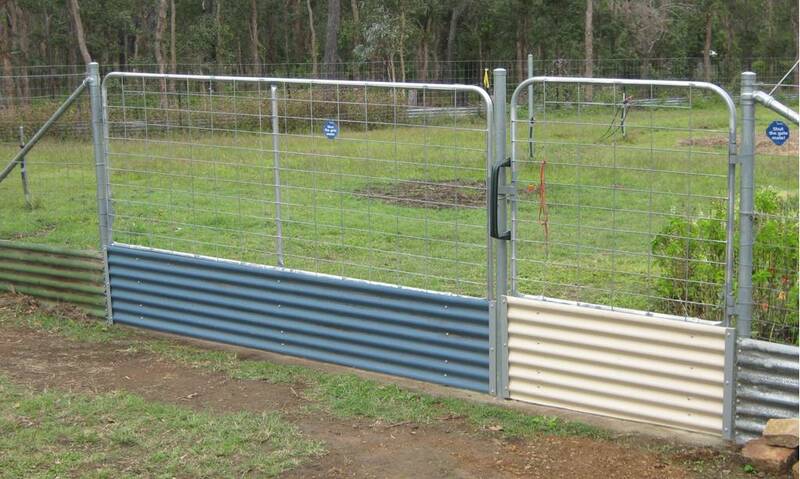 Our definition of a critter proof fence is to keep out bandicoots, rabbits, cane toads, foxes, dingoes, dogs, kangaroos, wallaroos, wallabies, betongs; and other critters like a neighbour’s stray goat, horse, cow or pig. There are some we will never stop, such as large pythons, and goannas. Qu “Where does a 300Kg gorilla sit?” Ans “Anywhere he wants!” The same with +6mt long pythons and +2mt goannas, when we come across them, we gently coerce them to move on, or call wildlife enthusiasts for assistance. 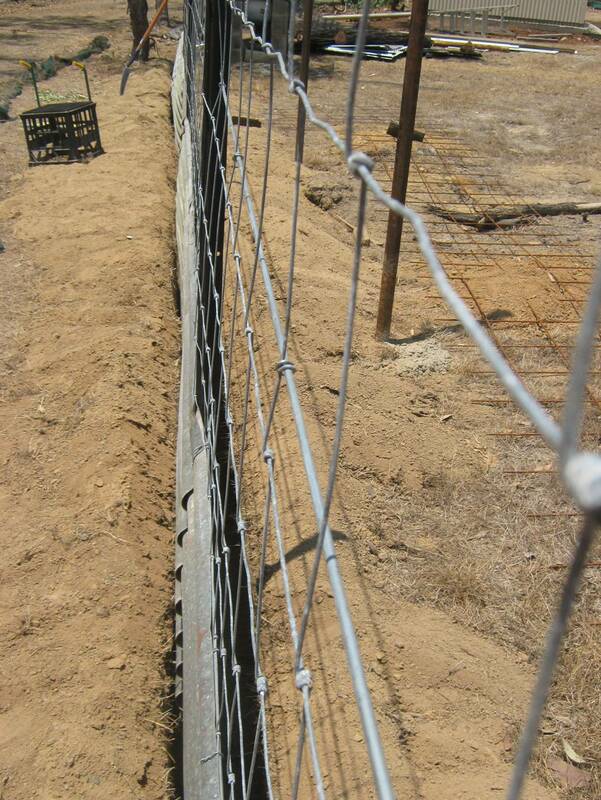 The fence is 165cm high, has three wire strands with dog wire mesh from the top strand 120cm down to the bottom strand about 50cm off the ground. 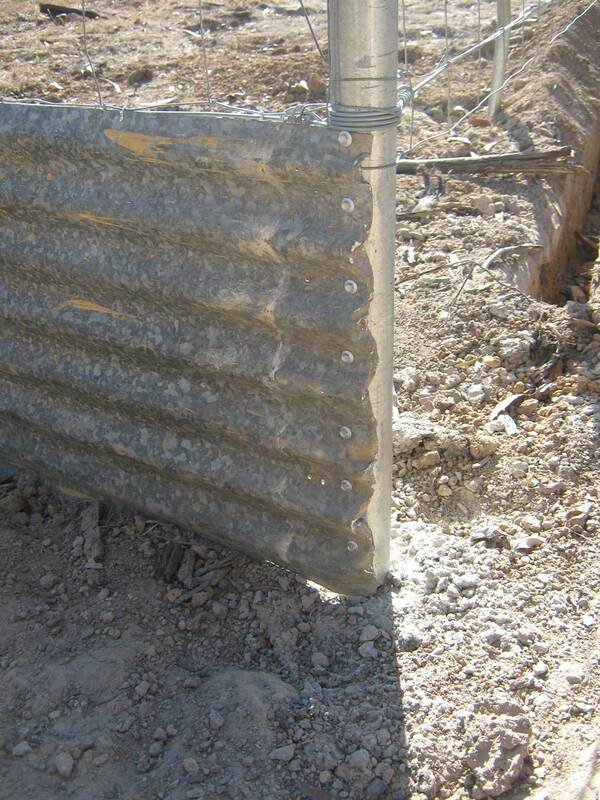 Recycled corrugated iron is hung horizontally along the bottom of the fence, trenched into the the ground about 20cm to 25cm. 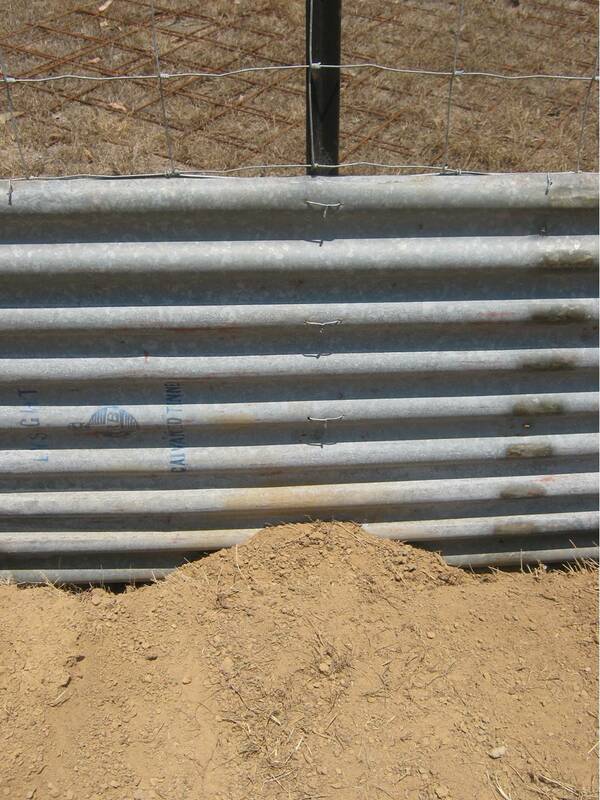 We found this design of fence is effective in keeping unwanted critters from the garden. 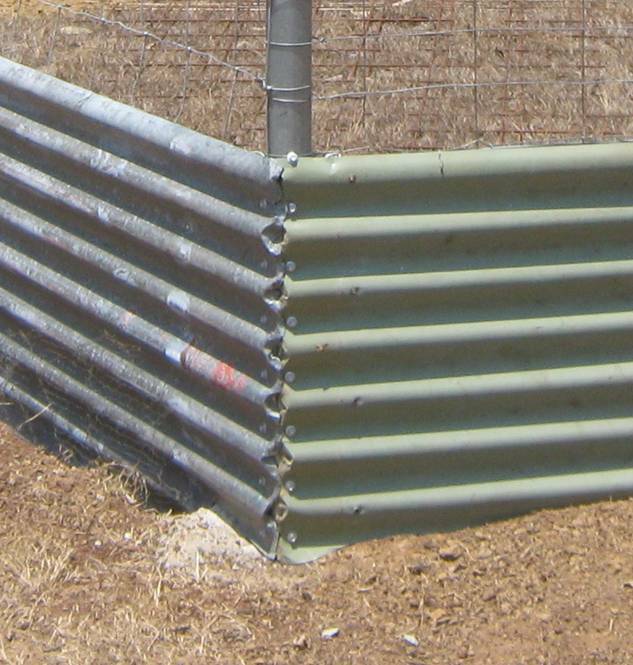 Some fences have a skirt buried outwards from the bottom of the fence, and while this was considered as well, in the last 5 years we haven’t found it necessary. 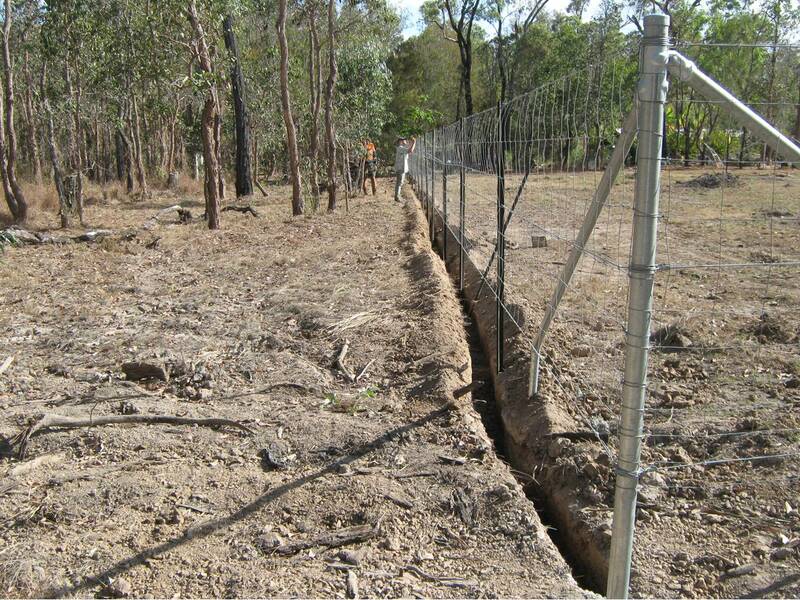 Digging under the buried corro iron will be challenging enough for critters. 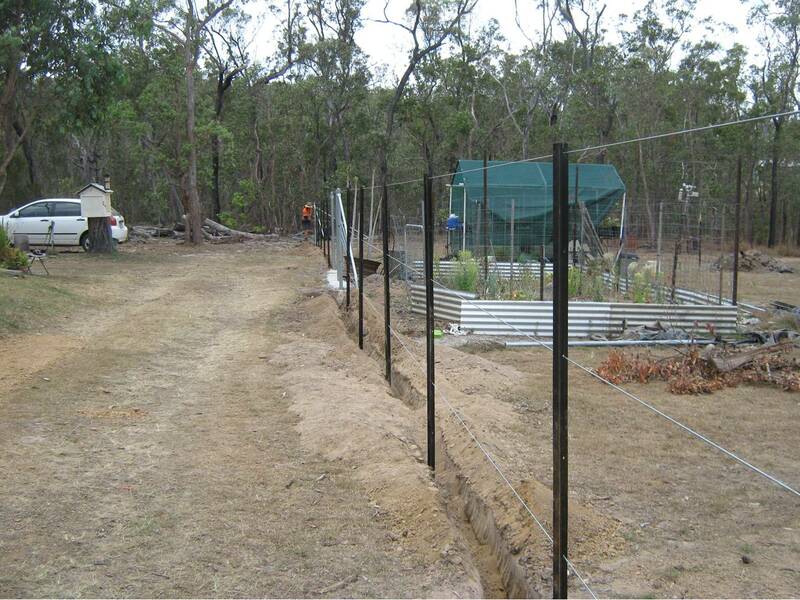 So in keeping with permaculture principles we have designed a fence which we know to be effective to keep out the critters and pests in our area. 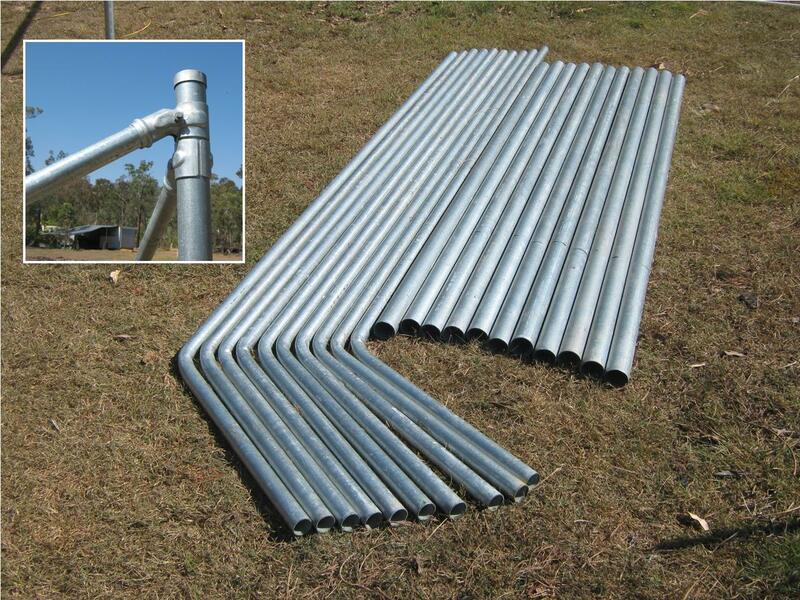 We chose to use galvanised pipe for posts and strainers rather than timber, for longevity reasons and given our local termite issues, we are simply too old to do things twice, or ‘the hard way’. Using galv pipe saved on labour costs and messing with heavy tree trunks and machines. The extra cost ended up being a small price considering the years it will last. First the corner strainer holes were dug by machine auger, the posts were cut and assembled and concreted in position as one piece, all bolted together. We used 2 inch posts, and 1.1/4 inch angled braces. 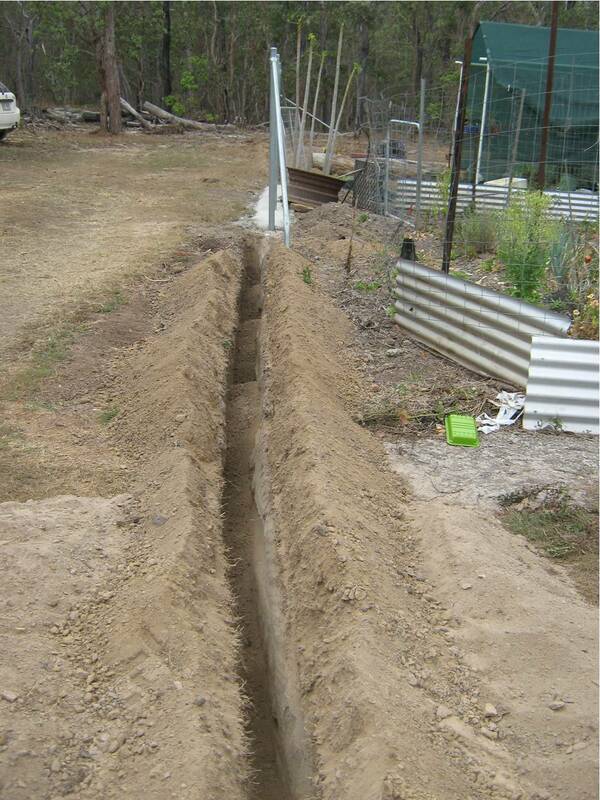 A trench was then pre-dug (by machine) between the posts to make burying the corrugated iron easier later. The star pickets (8ft / 2.4mt) were hammered into the bottom of the trench, and 3 wires strung above. Dog wire mesh was attached to the 3 wire strands with ring clips from the top down. The corro iron is hung down into the trench, tied to the bottom strand of wire, buried to an average depth of 25cm. The iron is also attached to each star picket to keep it from slumping. In hindsight (wonderful thing) this is only necessary if the inside will be used as a wall for a raised bed, as much of our fence line will be. The iron sheets are overlapped and screwed together. The end/corner sheet is cut away to fit concrete post base at the bottom, with minimal gap, then screwed to the post. Corner iron is crumpled over to prevent little unwanted creatures from getting in. Experience shows ‘young’ cane toads can get in if not. 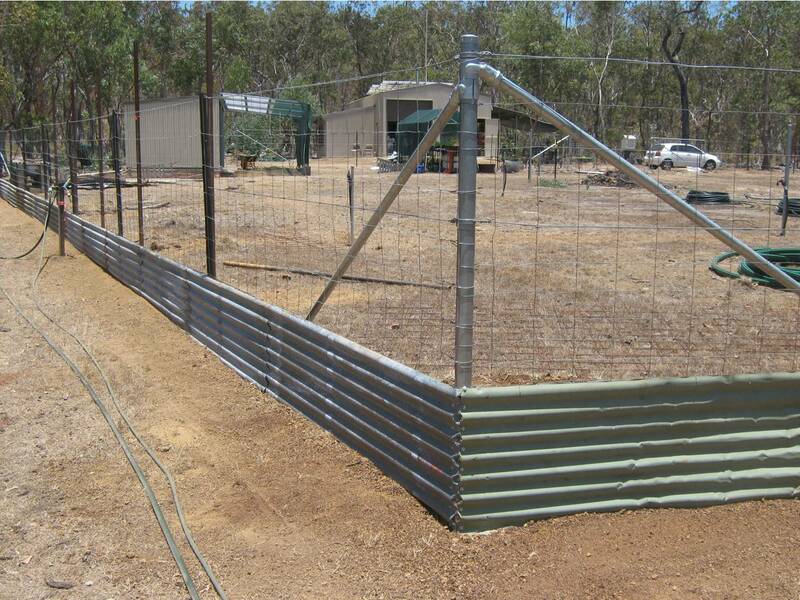 Our critter proof fence will keep cane toads, bandicoots, kangaroos & wallabies out of the garden, and protect chooks in the dome from dogs & dingoes. Possums are clever climbers and need to be dealt with on an individual basis. The gate hinges were welded on while being held in place. 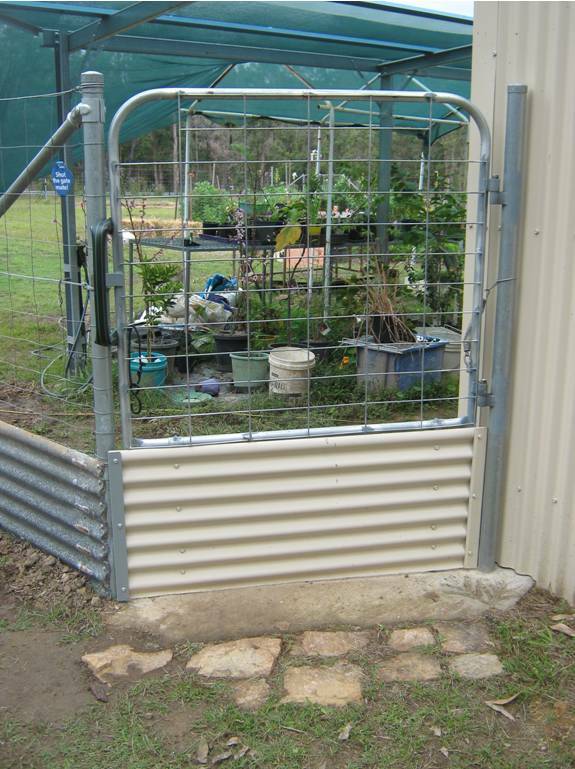 Gates have corro iron added to the bottom, cut to match the concrete step, preventing small unwanted critters getting through or under the gate. 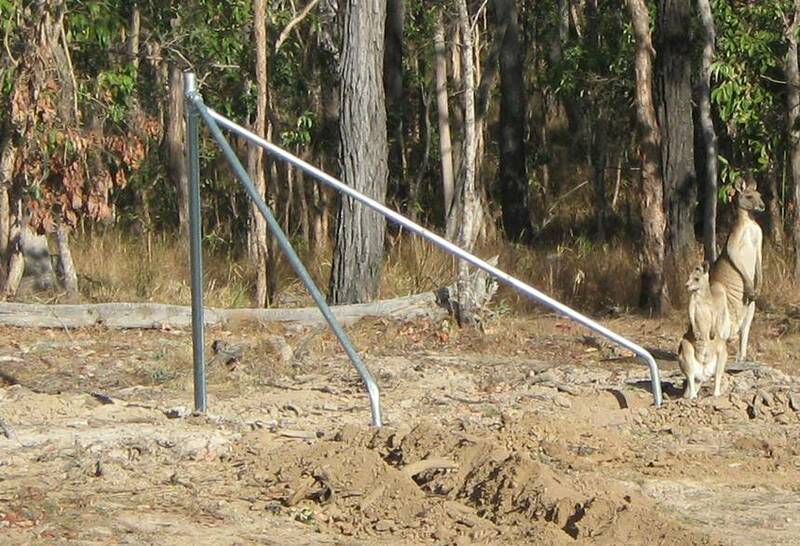 Note the trampoline spring to keep the gate closed. 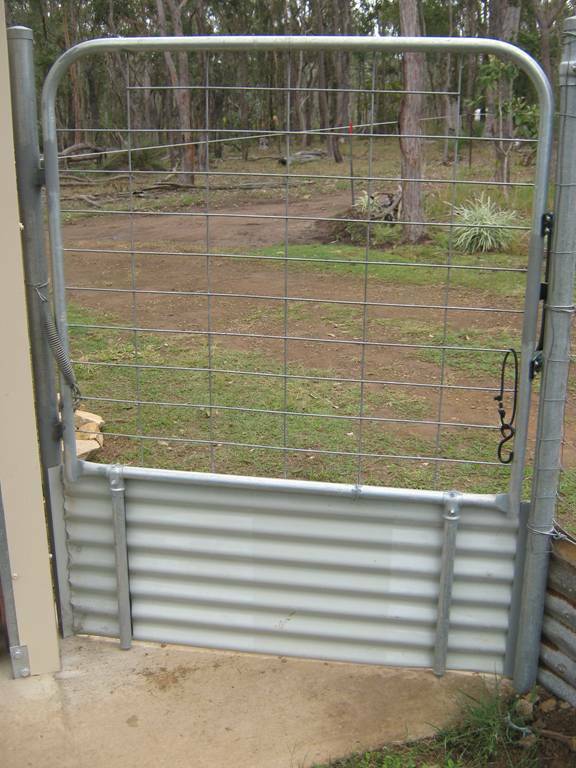 Tramp springs are plentiful & easy to find, and really suited to gate closing, in fact they are quite handy little buggas! 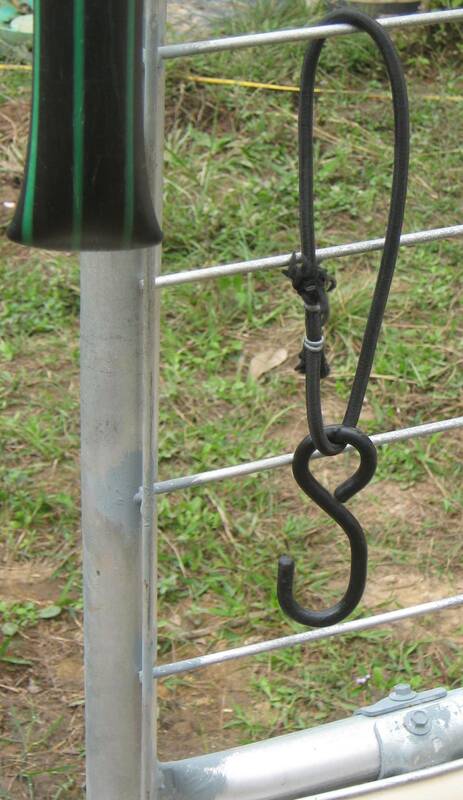 Big “Easy-Grab” Gate Handle is 1.1/4″Rural Pipe screwed with double screws to prevent slewing, works well & is cheap. Gate Holding strap, is old ‘tie-down’ hook, with stretchy elastic loop (cheap from hardware store), joined by using fencing ring clamp tool, clamping with double rings. Efficiently holds gate closed or open. 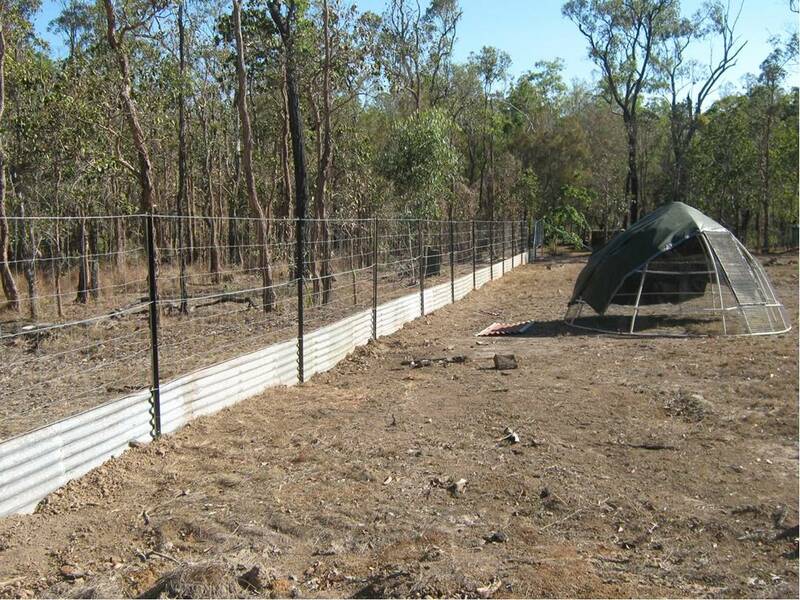 Categories: Building & Planning, Fencing | Permalink.